If you were expecting chatty, confessional or culinary mastery tonight, I'm afraid you're going to be sorely disappointed. My day began at ridiculous o'clock. It seemed to disappear pretty quickly and when I finally arrived home at crazy past darkness o'clock the thought of James Martin's warm chicken liver and chorizo salad seriously did not appeal. In fact food did not appeal period. The only thing I could hear calling me (other than a toddler who has been starved of mummy-love) was my lovely M&S Jersey Modal Bedding. But a challenge is a challenge is a rod for my own back. I had food to make. This was supposed to be lunch one day this week, but I've now had to jig the menu plans around so that I a) don't expire from exhaustion and manage to be up for a run at 4.30am and b) actually eat something. So Good Food's Edamame and Chilli dip won the day for its simplicity. Although I struggled with the making of this, it actually tasted really nice and fresh and light. Perfect for a summers day. Or a freezing cold night in the middle of January when you have already cooked two other different dinners (after a 12 hour work day plus commute) and really can't be arsed. Do excuse my French, but I'm about to nod off over my keyboard. The recipe suggests using frozen beans. I only had fresh so I followed the packet instructions. After double the amount of boiling they were still pretty crunchy so I just blitzed them anyway. My blender, however, is rubbish with anything that is remotely solid and refused to give me anything other than a rustic looking pile of sludge. Chopping veggies was as unappealing as it was dangerous for a tired person. (I'd also been awake most of the night thanks to endo pain - but that's a whole other story). So I tore up a flour tortilla, sprinkled it with olive oil, lime zest, sea salt and paprika and made some little crispy dipping things to go with it. Very nice. Lighter and healthier tasting than guacamole. 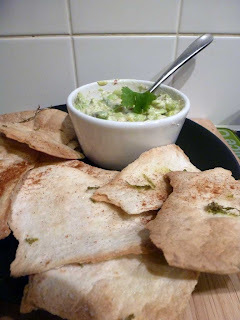 And although my dip wasn't as green as the one in the BBC Good Food picture, I liked that it wasn't all smooth and slimy. This, however, isn't really a real meal for a normal person. If I'd taken this for my lunch, I'd've been riffling through my colleague's drawer of goodies by 1pm for a naughty snack. More of a TV snack or a dip to present amongst a buffet table groaning with other filling goodies. One to keep for summer entertaining me thinks.